I have a confession: I hate E3. This is probably an unpopular opinion, but thankfully it is merely an opinion, hence the “opinion” tag. I’m not interested in arguing with anyone about why the new Doom looks great and why I’m a stupid, stupid-head (I’m sure it does, and I’m sure I am). Gamers: this isn’t about you. This is about E3. The simple point is that I like games, and playing them. Here’s an incomplete list of things I don’t like: PRESS CONFERENCES. Teasers. Exclusives. 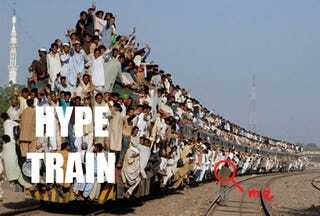 “The hype-train.” Pre-rendered footage. Pre-order bonuses. The same regurgitated content at every gaming outlet for a solid week. Frothing speculation over “winners” and “losers” when nobody wins because the games don’t actually exist yet. And more than anything else, I dislike corporate hand-jobs masquerading as news. Every year it’s a huge event, and every year I try and fail to get hyped for it. Fallout 4 surely looks like a great game, but I am not at all interested in seeking out advertisements for it, which let’s all agree is as much as any E3 preview has ever amounted to. In a few days they’ll be Youtube ads and I’ll be patiently waiting my mandatory 5 seconds until I can skip them. “But surely, poco, everyone thinks that until they announce the game you’re excited about.” Maybe so. But to this I say: XCOM 2 was announced two weeks ago, and while it’s something I’m incredibly happy to hear, I’m not going around proclaiming it to be the best week ever, nor do I consider Firaxis the “winners” of that week. My excitement is based in the currently-nonexistent game that I’ll be playing someday. Therefore, due to its intangibility, it’s a rather low level of excitement. I would not even call it noticeably different from my usual day-to-day excitement. Now let’s turn the tables; what if Square had chosen to announce the Final Fantasy VII remake in... May [audible gasps]. Who here would have ignored it? Is the hype experienced now “better” than the hype that would’ve been experienced then? Of course I’m not trying to over-simplify this event. There are plenty of good reasons for E3 to exist. Those reasons probably incorporate phrases like “synergy” and “brand-awareness” (I just puked in my mouth a bit). To put it one way: if you are on a board of investors, you’d damn well better get your game to E3 and it had better be the shiniest, pre-renderedest teaser announcement at the whole show. But how many people here are on boards of investors? An event like E3 must be buoyed by the boundless enthusiasm of gamers, yet those gamers rest atop a foundation of absurd marketing budgets and cynical money-grubbing decisions. I would never ask that gamers stop being excited about the games they’re excited about. That’s the core of any hobby, be it LARPing or birdwatching. It’s all about people’s passion. And yet I have to wonder about how healthy it is for the game industry to exploit this passion so blatantly. With each passing year, gaming grows to include a more and more diverse audience, yet E3 could not possibly be clearer about who it’s targeted at. It’s for Gamers™ in the narrowest definition possible. It’s for the people who would sit through an entire press conference for only the most fleeting glimpses of new information about games we won’t play for months or years (or ever). It’s for people who construct elaborate arguments and defenses based on those fleeting glimpses. It’s for sequel-lovers and sequel-haters; god forbid you go into E3 2015 without an opinion on Fallout. Whether you’re currently preordering Fallout 4 or writing a manifesto on how the series has betrayed you personally, E3 is for you. I imagine I’m not the only person who waits out E3 like a teetotaler at Mardi Gras. To all those other gamers hunkered down in their backlogs, quietly enjoying their games the same as always and waiting for the madness to die down, I salute you. pocoGRANDES sometimes writes for Talk Amongst Yourselves, the Kotaku reader blog. Sometimes like now.